Like a lot of middle schools, Bret Harte’s hallways carry with them the faint scent of Axe Body Spray and the sounds of kids shuffling to class. The school sits in the middle of Oakland, nestled below the big Mormon Temple. Outside, backpacks dangle from a tall, chain-link fence encircling a busy baseball diamond. A hallway in Bret Harte Middle School. The school's newcomer program takes in recently arrived students from all over the world, many who are asylum seekers, refugees, and unaccompanied minors. This isn’t a dynamic unique to Bret Harte. Several middle schools throughout Oakland Unified School District have newcomer programs, and the population of newcomers in the district has dramatically increased in the past three years, especially when it comes to high schoolers. Four years ago, the number of high school-aged newcomers in OUSD was close to 600. In 2017, it’s more than doubled. Most of these students are asylees, refugees, or unaccompanied minors. They’re fleeing countries like El Salvador, Honduras, and Guatemala, where systemic gang violence and extreme poverty are causing war-like conditions, driving kids to make the perilous journey across the border by themselves in search of refuge. Once here, many go through the complicated and backlogged court system to try and win asylum or special juvenile immigration status. This process has gotten even more difficult under the immigration policies enforced by the Trump administration. The Oakland Unified School District helps connect students to free legal counsel. It’s one of the many ways in which schools serving newcomer populations provide wrap-around needs for their students. Over the past four years, the numbers of high-school aged newcomers has steadily risen. Above, projections of the number of students expected this year and next. 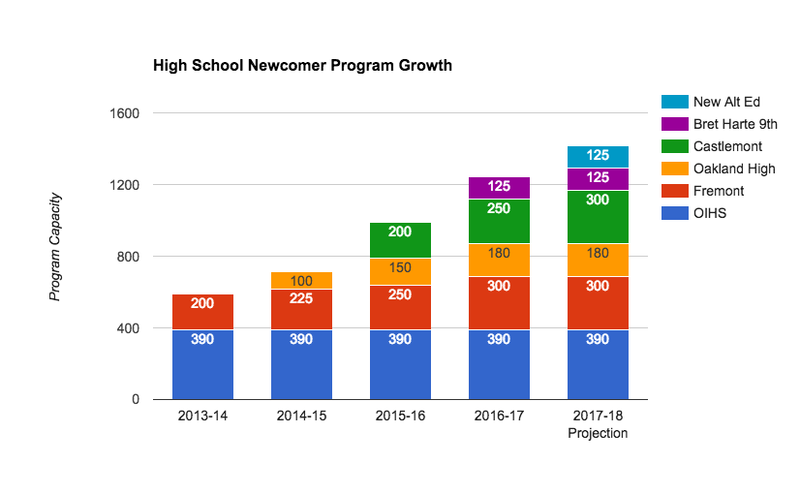 Bret Harte Middle School saw that the number of high school-aged newcomers was growing, and that the four high school newcomer programs in the district were reaching capacity. So they made a big change to their newcomer program, creating a ninth-grade class to take in high school-aged students. The school made a good candidate for this expansion in part because they had the physical space to accommodate an expected 125 new students. They also already had the infrastructure in place. They have experienced newcomer teachers, plus a wellness center that provides health and counseling services to students and their families — a crucial element in educating kids who might have experienced horrific violence, interrupted schooling, or sexual trauma in their past. Plus, the opportunity to grow the program created a lot of excitement in the school community. Martín is one of those students (for safety reasons, we’re not using his real name). He’s from El Salvador, has a sweet sideways smile and crumples paper nervously in his hand when he talks to me. He tells me when he first got here, he was surprised -- in the best way -- by how respected and welcomed he felt, both by his teachers and by his peers, who are from all over the world. He’s been picking up Guatemalan slang from his classmates who speak an indigenous Mayan language, a little Arabic too from his peers from countries like Yemen. Martín likes school, particularly math and science class, but back home it was hard for him to attend. “Where I lived it was very dangerous,” he told me. Lots of people were afraid to leave the house, and the only safe place was church. That’s because when you reach a certain age, gangs begin to forcibly recruit young men and threaten them if they don’t. Once Bret Harte opened its doors to high schoolers, they began to steadily enroll. “Starting in January, we took on about a hundred students in a month,” Wolfe tells me. Teachers found many of their students were having a hard time getting to school. They tended to live in Fruitvale, or in deep East Oakland. There are other high schools with newcomer programs in those neighborhoods -- schools like Castlemont High and Fremont High -- but those programs were largely at capacity. There’s no school bus system in the district, so Bret Harte can be a trek for a lot of the school’s new students. “Because the fact that they [other high school programs] are full they are coming to us, by two, three different buses sometimes just to get to school in the morning,” says Brian Tang. He’s the community schools manager at Bret Harte. Like a lot of teachers here, he grew up in Oakland and knows its streets like the back of his hand. He says there’s a lot of intangible knowledge that goes into getting to and from school safely that the newcomers just don’t have. A section of the school's family resource center, which is open to the students and their families. Navigating the outside world to get to school can be tough, but what educators struggle with most is the fact that so many newcomer students have to work. One student -- whose name we’re not using -- described her newcomer experience in a letter written in Spanish. She wrote that she left her whole family behind in Guatemala to make her American dream a reality. She sends money to her family back home and pays rent. She writes that at Bret Harte she has wonderful teachers and good friends, but she can only go to school a couple days out of the week because she has to work. No one else supports her economically. Being in school only part time means that it’s harder for her to learn English, and it’s going to take a lot longer for her to graduate. This is a problem a lot of newcomers face, and the school district knows it. Starting next year, it’s going to try a new alternative high school program specifically designed for kids who have to work, with more flexible hours to accommodate job schedules. Katherine Wolfe says she’s glad the district is scaling up its solutions. As much as the school is trying to meet newcomers’ needs, there have been some setbacks. The district is currently experiencing major budget cuts, so Bret Harte had to let go of a part-time staff member, a fluent Spanish speaker who helped enroll students when they first arrived. The principal, Dr. Bianca D'Allesandro, also told me the school was considering extending the ninth grade class into a full fledged high school program, but that because of financial restraints, that plan is on hold. It’s also just really hard to predict how many newcomer students are going to enroll each fall. In the past, the OUSD has gotten it wrong. Regardless, educators like Wolfe say they’re prepared for whatever comes next.